Today's review is Vengeance Born by Kylie Griffin. 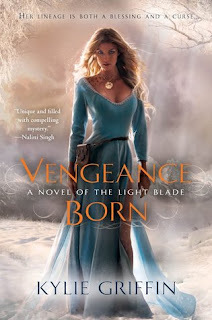 Vengeance Born is Kylie Griffin's first novel in her Light Blade series and let me tell you, this is THE BEST new series of 2012 for me and possibly the best EVER! Finding new books is so hard for me, so when I find an author I like, I pray with all my might that they have 30 other books previously written that I can move onto. Unfortunately, this is Kylie Griffin's first book, but let me tell you, she's now got a groupie for life! I'm a sucker for paranormal. And paranormal romance? Woowee! Excuse me while I fan myself. Vengeance Born has all the marks of a well-fleshed fantasy world as well as characters that you really want to see united. At the end of this book, I was already thinking about which characters I wanted to get together next and how it would be if even more characters were entered into the story. This book was so good, I think I finished it in 4 hours. I could not put it down! Vengeance Born is the story of Annika. She is half human and half Na'Reish, a demon race that is constantly at war with the humans. Annika's father is the leader of the Na'Reish. He raped her mother, simply because he could, and because he knew that a half-blood child (a Na'Chi) would never be accepted among the humans. She was to be a constant reminder of the demons' superiority over the human race. Annika, with the help of a captured Light Blade warrior, manages to escape the demon city and Kalan takes her to his village. Annika has no lover for the demon population that she grew up in and endeavors to help Kalan bring peace between the races. But the Na'Reish are a vicious race and are determined to prove to the humans that Annika is no different. I can't tell you how much I loved this book. The world that Kylie Griffin crafted is exquisite and unique. The characters practically leap off the page in their realness. Annika is a woman who doesn't fit into the world she grew up in and doesn't belong in the world she longs to be a part of. She doesn't trust her gifts and doesn't understand her own value. Kalan is a stubborn warrior, set in his ways. He doesn't trust Annika, because he has seen the destruction caused by the Na'Reish and believes that even though she is half human, that she is just as savage. Their love story is touching and grabs a hold of your heart and the underlying battle has you rooting for world peace.